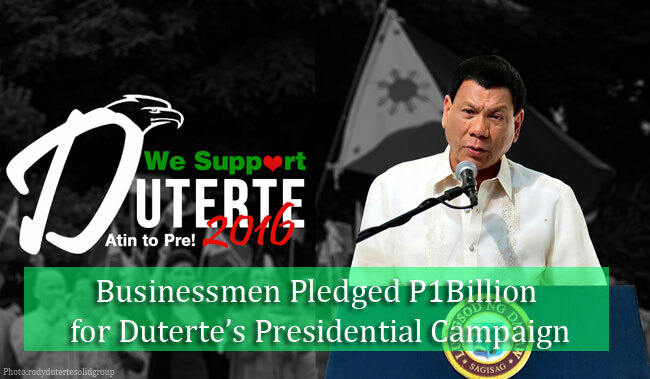 Though Davao City Mayor Rodrigo Duterte publicly announced and made clear that he does not plan to run for the 2016 presidential seat election, a group of anonymous businessmen had pledged P1 billion to support the mayor’s campaign. The group profess that the sole reason for backing up the group is to alleviate the country of crime, corruption and illegal drugs. According to the known Duterte supporter Atty. Vitaliano Aguirre, the financial aid promised by the businessmen had no consequences or any staring attached. They just wanted the mayor to run for presidency. Aguirre shared that the said offer was made by the spokesperson of the group of businessmen, Benigno Gopez. The offer was made after Duterte’s supporters had gathered at the Quirino Grand Stand on September 26, 2015. Aguirre refused to name those who had pledged to fund the mayor’s presidential campaign and the group wants to remain anonymous. However, the mayor was firm when he said that he won’t run for the presidential seat as he had not enough funds. As it can be remembered, he confessed that he does not have enough money for a nationwide campaign and he won’t ask anybody for it. Aguirre made clear that the money that was pledged for the mayor’s campaign does not require any compromise. In the 30 years of Duterte’s service in Davao City, it was incredible that he was able to do a lot for his his city despite having no private group backups. He was also able to have a no corruption record. And though Duterte might have someone contributing to his cause, he still does not have any corruption record. This does not only show that he does not abuse the money of the people. But also he is able to choose well the people working under him. The lawyer is confident that Duterte will run in the next year’s election. He also cited a text message from the mayor to his followers to give him some time to think about it. The message was read during the supporter’s meeting. At the end of the message Duterte promise that he will not let the people down.